So after making the lacy shawl on the needles, I was determined to figure out a nice lace pattern on the Knifty Knitter looms! The one thing I enjoy most about these looms is the openness of the knitting due to the gauge and peg size. Some people see this as a drawback - I however try to look at it as inspiration for some different looking things that can really only be duplicated on a large gauge knitting loom like the Knifty Knitters. So...I put my mind to it and came up with this pattern. My entire shawl isn't completed yet - but I've been madly working on it. I'm simply in love with the fabric that the stitches create! The thing I like about it is you can't tell it came off a KK loom! Now - I wonder if I could duplicate this pattern on the needles.... It would be kinda hard to duplicate the waviness of the "ribs" going up. See how the slightly jog back and forth? Loom Used: New Kifty Knitter II long green loom used as a single rake. However, this pattern can be created on any large gauge loom as long as you use an even number of pegs. Other Notes: I got my yarn, and my new Knifty Knitter long loom set, at Hobby Lobby. I've never seen the yarn before, but I found this online. I really like the yarn and would definitely use it again! Also, I know this little beauty will need to be blocked to get the right finished look. Lace stitches just never look right without a good blocking. Here's a little tutorial that I used to learn how on my needle knits. UPDATE: New completed shawl pics are here! Take a look! i love the pattern on the new shawl. 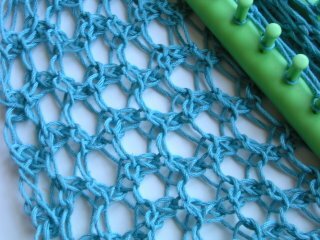 i ordered the pattern and i am going to make a wrap for the beach. Thanks for the compliment! I think a wrap for the beach is a great idea! Sign up for the loomknittingdesigns.com mailing list!